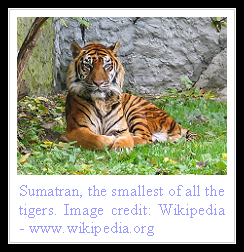 The smallest subspecies of tiger, Sumatran Tiger has resided for millennia on the Indonesian island of Sumatra. Its complete isolation and relative stability for thousands of years has enabled it to develop a unique genetic print, that may one day enable it to develop into a unique specie altogether. This significant finding has raised international calls for the prioritization of protection and conservation efforts for Sumatran Tigers above all other tiger subspecies. Panthera Tigris Sumatrae, the Sumatran Tiger weighs in the range of two hundred and fifty to three hundred pounds for males and one hundred and sixty to two hundred pounds for adult females. Length is about seven and a half feet for males and six and a half feet for females. Body color is darker than other tiger variants and stripes are narrower. Face and neck is characterized by marked growth of hair, giving the appearance of a mane. Paws have webbing between toes that enables the big cat to swim at quite a rapid pace. An inhabitant of dense lowland and mountain forests, swamps and peat moss forests, the Sumatran Tiger is a solitary and nocturnal feline that takes a variety of prey animals for food. These include wild boar, tapir and deer typically but also fowl and fish at times. Even orangutans are hunted when they come down from trees. Other animals included in the cat's diet are porcupines, crocodiles, snakes and young rhinos. The tiger has been seen forcing some of its prey to take to water in a chase, where it swims over and kills them. 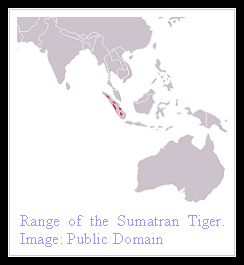 Early in the twentieth century, tigers occupied nearly the entire island of Sumatra. They are now only found in some scattered and segregated reserves. Many tigers live outside the protected areas and are shot by poachers or come into conflict with locals. They are among the many species on the once serene island of Sumatra that are losing the battle of survival to human encroachment. Mating season for Sumatran Tigers is in the times of winter and spring though they have been known to mate year round. Pregnancy lasts three and a half months following which a litter of up to six cubs is born, with two to three being the norm. The young begin to venture outside their den at two weeks of age and start hunting at around six months. Independence is gained at two years of age. Lifespan is known to be fifteen years in the wild and twenty years in captive programs. There are an estimated four to five hundred Sumatran Tigers remaining in the wild. Loss of habitat owing to logging and agriculture is ongoing and putting further stress at the ecosystem that supports the tiger. Many continue to be killed by poachers with their parts appearing even in North America apart from the traditional markets of Taiwan, Hong Kong, China and South Korea. The magnificent cat is currently on the IUCN Red List of Threatened Species with the classification being Critically Endangered. There is some hope though of the preservation of Sumatran Tiger, derived from its healthy numbers in captivity and from signing of a recent cooperative program for saving the big cat between Indonesian wildlife authorities and Australia Zoo, whose former patron Steve Irwin had a great passion of conserving the beautiful Sumatran Tiger. Ever heard of Javan and Balinese tiger? Thanks for stopping by. The Javan and Balinese tigers have not yet been profiled here since they are extinct. Hope to find time to write about them too some day. ive heard of them but what r they? ...It says that in the article. Decent post. It is really helpful to us. An opportunity to read a fantastic and imaginary article. Its really a good article. It gives me lots of pleasure and interest. Eva state of the art Processing Technology , Healthy Ingredients and Quality Packaging these simple resultant makes oil that is healthy and tastes great.